Northwest Vietnam is greeting autumn with a glamorous view of golden crops on the terraced fields at the foot of the impressive Mount Fansipan. Terraced fields, which look like “ladders to the sky” from the mountainous villages are always wonderful attractions for foreign tourists. 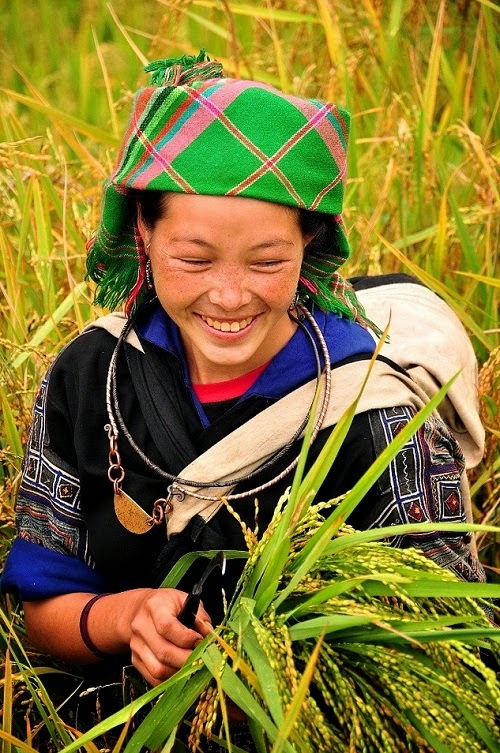 The fields, created by talented and diligent ethnic farmers, have remained there for hundreds of years. Terrace farming is the way that people adapt to their environment. Think of a steep-sloping hillside. If this is the only land you have to grow crops on, how do you then grow crops without everything sliding down the hillside? Since ancient times, mountainous farmers have built terraces to shore up a hillside, creating several levels of farms. In a small, seemingly inhospitable place, they can grow the crops they need to grow to survive. Instead of flowing freely down the hillside, water stops on the level plain. In this way, the lower terraces are not eroded and, also, the higher terraces get enough water. On a straight, steep slope, water would tumble down the hillside, carrying crops and much-needed soil with it, letting nothing grow. But add the element of a terrace, and you have flat areas on which to farm. A terraced field has many levels in series and each level is a small field. The more levels there are, the more farming techniques the owner has. Given the scarcity of flat land, wet rice growers use hillsides to create an even and flat plot of land which looks like a three-step staircase. 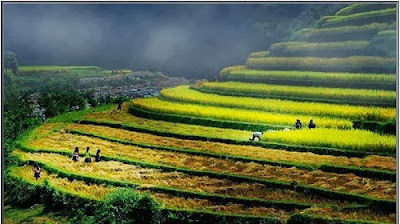 That’s the way terraced fields were created, a rare feature of Vietnam’s wet rice civilization. Giang A Pua of the Mong ethnic group in Ha Giang province told us about how he chooses the land for growing rice: “The hardest work is land reclamation. The field location should not be very sloppy with less gravel. A good place is where there is thick grass or big trees”. 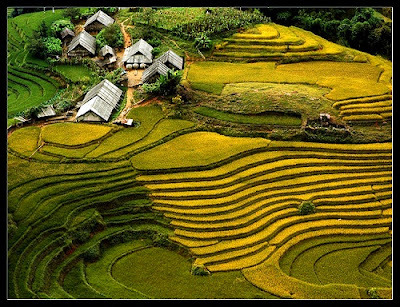 The history of terraced fields is associated with the history of residence of ethnic groups in Vietnam’s northern mountains. Their cultural values are reflected in the farming experience, production customs, the formation of terraced fields of each ethnic group. One of the most prominent examples is in the rice field of Southeast Asia. Acre after acre of what looks like unusable land contains terrace after terrace. Much of the rice that comes from Vietnam, Thailand, and other Southeast Asian countries is grown on terraces. Rice, especially, needs a lot of water to grow. The more flat areas existing on which to grow rice, the more rice people can grow. And with the terrace farming idea, water stays on the level surfaces, so rice grows in places that, on first glance, wouldn't necessarily look to be good farmland. The land exploitation and rice cultivation has been maintained from generation to generation over hundreds of years. Each terraced field creates a beautiful picture on the hillside. Together with the formation of terraced fields and the sedentary farming, ethnic groups the northern mountains have adopted many traditional festivals and cultural activities associated with agricultural production. Thao Thu Do of the Mong ethnic group in La Ban Tan commune, Mu Cang Chai district, Ha Giang province, told “The Mong people consider a terraced field an invaluable basket of rice. The field is most beautiful when the paddies turn yellow. When there are abundant rice, we feel very happy”. During the harvest time in October, the gold rice field stands out of green forests, creating a magnificent picture in Vietnam’s northern part.